Historic prairie architecture is disappearing. That famous sentinel, the grain elevator, is being replaced by concrete terminals. The hip roof barn of calendars and cards is giving way to prefabricated metal buildings. Vinyl is covering historic facades. 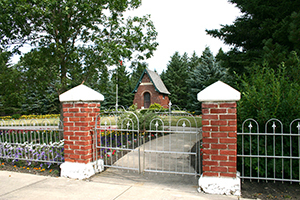 As with the Prairie Churches Project, this was a collaborative effort with the J. M. Kaplan Fund of New York, the Thomas Sill Foundation and the Historic Resources Branch of the Province of Manitoba. Kaplan and Sill contributed $65,950 and $63,450, respectively, to the project for a total of $129,400. The Historic Resources Branch provided technical assistance and the allocation of existing budgets for heritage preservation. This project has been discontinued. 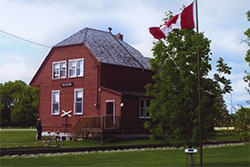 The selection of icons funded was subject to a proactive process that sought to identify the most unique architectural structures of a particular type in rural Manitoba. 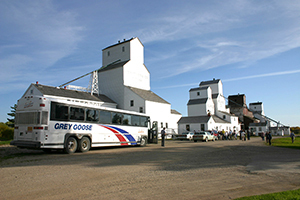 Barns, railway stations, bridges, grain elevators and so on were eligible for consideration on a matching basis. 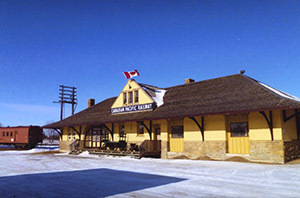 Canadian Pacific Railway Station, Portage la Prairie. Manitoba’s rural architecture is under-appreciated and, therefore, threatened. This project has helped to raise awareness of that threat by focussing on the best examples for preservation.